Okay, so, I will admit it: I sort of have a repurposed jar problem. I fell in love with this picture of a jelly-jar centerpiece on Simple Bites awhile ago. So pretty. So candlelit. So many jars! I did not, at the time, have a collection of jars, so I started saving some. These are about to get much more attractive. Not in the magnetic sense. I would say I can stop collecting them any time, but I think we all know that’s a lie. But we go through a lot of jars. Jam, applesauce, olives, coconut oil, bruschetta, salsa. I have my eye on the jar of capers in the fridge, too, but those seem to last forever. So now I have this stash. This… hoard. This ever-growing stockpile of glass. Either that, or I’m going to need a bigger kitchen table to hold this centerpiece. Pour, splash, slosh. It’s all good. Here’s how I get them ready to reuse. 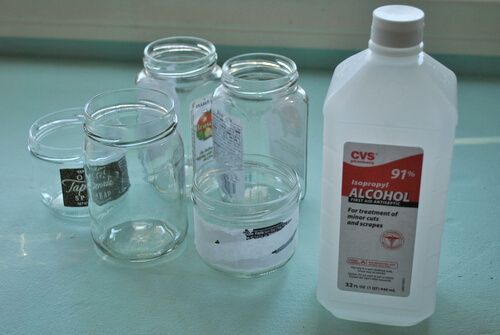 I run the jars through the dishwasher, peel off whatever I can of the label, then soak the jars in rubbing alcohol. If you put a little bit of alcohol in the bottom of a tray, you can just plop in the jars and turn them over every once in a while until all the sides have soaked. This is when I usually get distracted and wander off to make lunch or fix a lego disaster or convince the toddler that we do not lick the walls. By the time I come back, the rubbing alcohol has dissolved all the glue, and whatever’s left of the labels wipes right off. Short attention span for the win! Whatever was in here, we ate it way before that. And now for the date stamp. 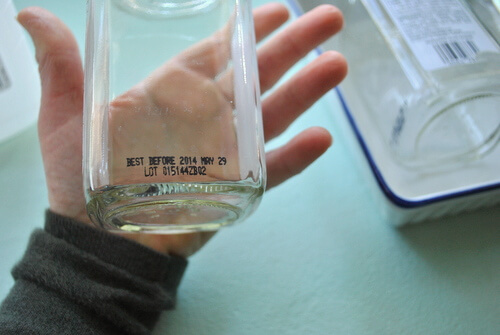 But argh, there’s still this sell-by date stamped on there. What to do, what to do. You guys. I only have the one cleaning trick. We’re going to scrub it with… rubbing alcohol! It’ll come clean in a minute. Ta-daa! Like a little glass parade. 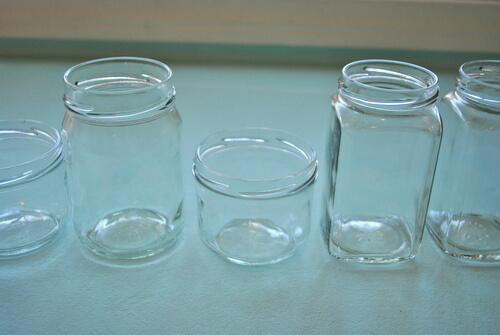 Lovely, shiny jars! They’re taking over my house. But in a good way, really. P.S. 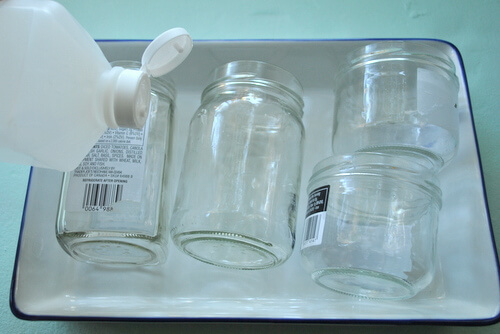 – After the jars, try this. It’s time to get back in touch with your best self. Maybe life got busy and you didn’t notice yourself slipping away in the routines. You need the (free!) Find Yourself mini course. You’ll get five little lessons in slowing down, listening for the voice inside you, and figuring out who you really are. 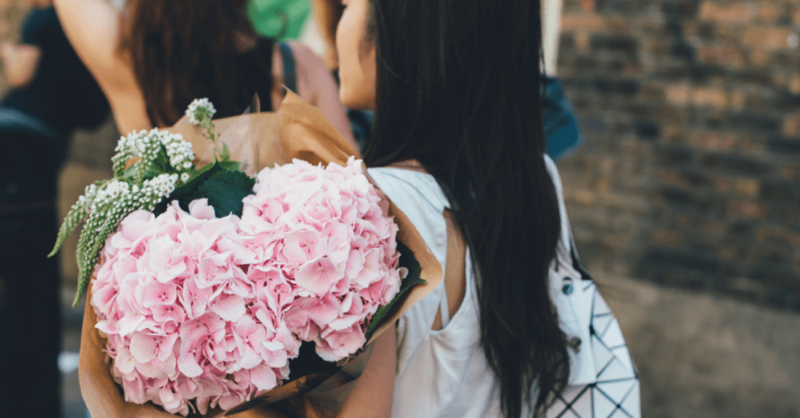 Sign up to get the Find Yourself, Free Yourself mini course, totally free.